When choosing the right envelope for your needs, decide where you would like the opening to be placed as there are different options available to you. Wallet and banker envelopes have the opening flap placed on the long edge of the envelope which is what defines the envelope as a wallet or a banker, hese are probably the most commonly used envelope styles. Elsewhere on our site we have definitions of Iternational C4 and DL envelopes and American envelopes such as Lady Grey, Carr's, #6¾, #9 and #10. What Are The Different Types Of Envelopes? There are 3 common types of envelopes these are known as: pocket; banker and wallet. 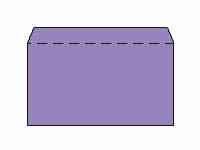 With pocket envelopes, the opening flap is positioned on the short edge which is what defines the envelope as a pocket. These envelopes are commonly used in all applications. The wallet envelope normally has a trapezium shaped flap which is suitable for automatic mailing machines and can come in straight or slightly curved variations. The banker envelope has a triangular flap which is traditionally used in the greeting card industry and for personal use note/letter paper and cards. They can often be referred to Greeting Card or Invitation Envelopes which you may have heard of. There are other types of envelopes available these days,some made of materials such as transparent plastic, others with bubble wrap inserts (aka Jiffy Bags) and some made in special shapes for more expensive greeting cards or special invitations. 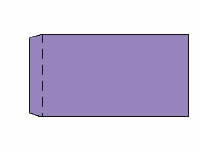 However there is one that is worth metioning in its own right - the gusset envelope. 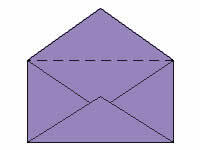 A gusset envelope is usually a pocket envelope with expandable sides. They have been created to withstand larger, bulkier items such as catalogues as their sides can increase making the capacity of the envelope greater. These are available in block bottom and V bottom options.